I thought I would revive and expand my post from the previous forum. Stamp duty was introduced in England in 1694 during the reign of William And Mary for the purpose of funding costly wars. Specifically, the Stamp Act was introduced as 'An Act for granting to their Majesties several duties upon vellum, parchment and paper, for four years, towards carrying on the war against France'. 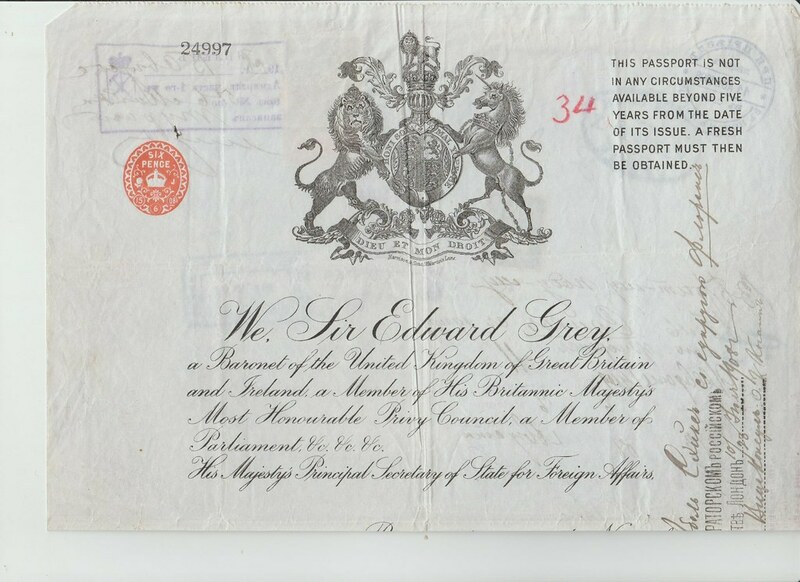 The Stamp Office was established to collect the six rates of duty; 1d, 6d, 1shilling, 2s6d, 5s and 40shillings which would be applied to various legal and financial documents by embossing. Each embossed stamp was a different shape to prevent any possibility of fraud by simply altering the value. The bottom right example shows a triple of the common 6d value used for affidavits, writs, leases, passports and marine charters. The triple example indicates two additional duty increases and was therefore used between 1714 and 1757. The top right example dates from 1783 and represents six duty increases, the duty now totalling 6shillings (you have to add up all of the values embossed on the stamp to get the total value; VI PENCE VI PENCE VI PENCE 1 SHILLIG around the top of the stamp and 1 SHILLG VI PENCE 1 SHILLING at the bottom). Documents were also produced on vellum and parchment which are animal skins and did not take to being embossed. 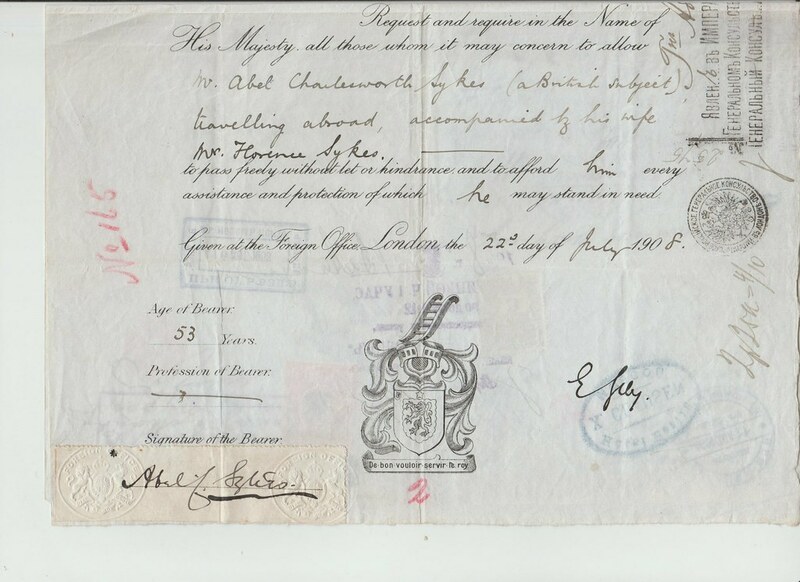 Therefore, another method was required to attach embossed duty stamps, this method was called escutcheoning. It consisted of a using a separate piece of paper, called the escutcheon, and affixing it to the vellum or parchment document with an adhesive and then embossing the escutcheon. But it was soon discovered that this escutcheon could be easily removed and re-used for fraudulent purposes. Therefore, a new method was required and this consisted of using an additional metal strip (used like a wide staple) to affix the escutcheon by making two slits through the escutcheon and document and the metal strip applied like a staple with the ends folded back behind the document. The escutcheon and metal strip are then embossed and a label applied on the back of the document over the ends of the metal strip as a further security device. The label bearing the Royal Cypher of the reigning monarch and are hence known as cypher labels. These are sometimes called the forerunners of the printed postage stamp. An example of an escutcheon type stamp can be seen in the top left and a cyher label can be seen next to it. I'll post again later on this subject. I like to see Revenues used in context, still attached to the documentation. 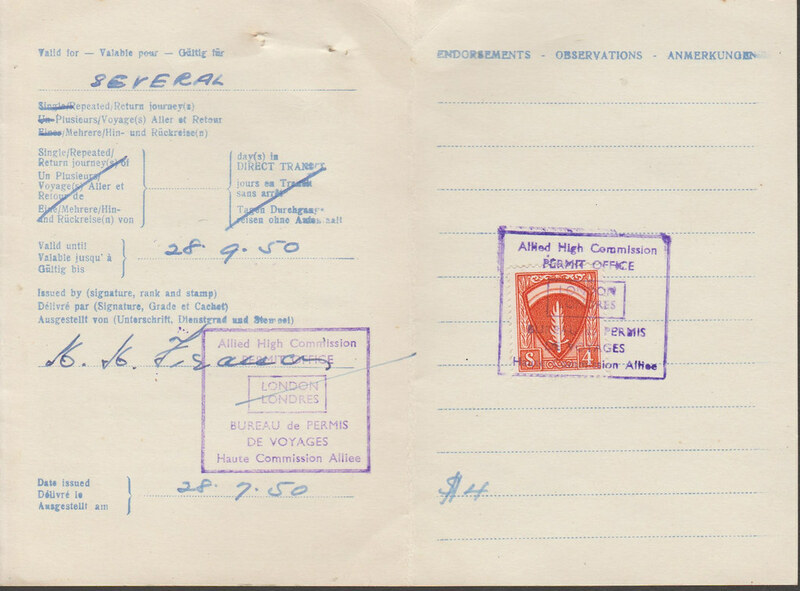 Here's a scan from a 1930s UK passport with 8/- worth of revenues. 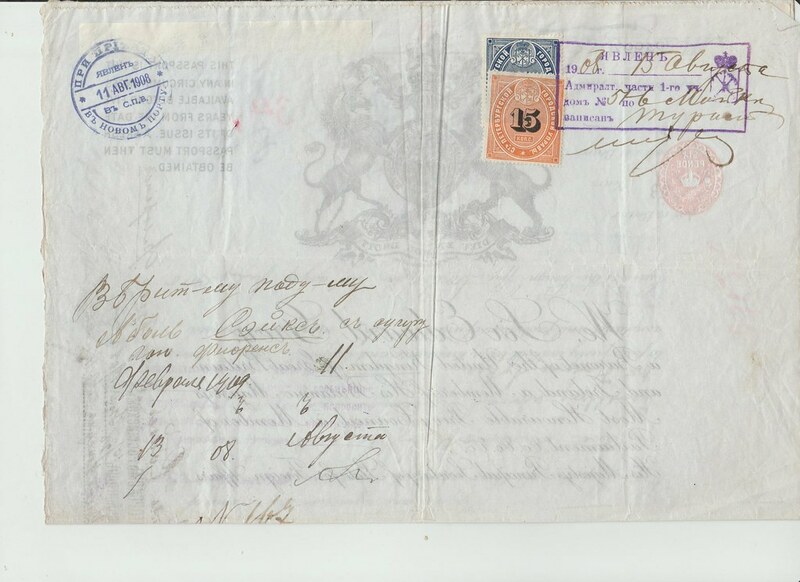 A couple more documents picked at random, showing both a US revenue stamp and a good old 1881 1d lilac used a revenue stamp on a self explantory receipt. And what I believe to be a page from a Japanese health or pension scheme stamp book. A nice British example of one of these, ideally with different valued stamps, is on my shopping list. The flaming sword represents avenging Allied forces; the black, the darkness of Nazism; and the rainbow, the liberty to come. This then left the question of exactly what they were. It was tempting to think that they were some sort of postage stamp but after a Google search I found a stamp company selling some. It turns out that they were used as military travel permit revenues. I couldn't find them in any of my catalogues, not even Scott Specialized Catalogue of United States Stamps & Covers but the stamp company that does have them, Rigastamps in the US, shows Yvert & Tellier (French) catalogue numbers and Bush-Cash (I have never heard of them) catalogue numbers. The one marked GRATIS is clearly used when no fee is required. The other stamp is denominated $1 and is overprinted in German Marks, the Rigastamps site shows 2 other versions of this overprinted stamp. I wonder if there were any other basic stamps, does anyone know anything else about them? these stamps are almost always described as "military travel permit stamps" but this is a reductive definition. 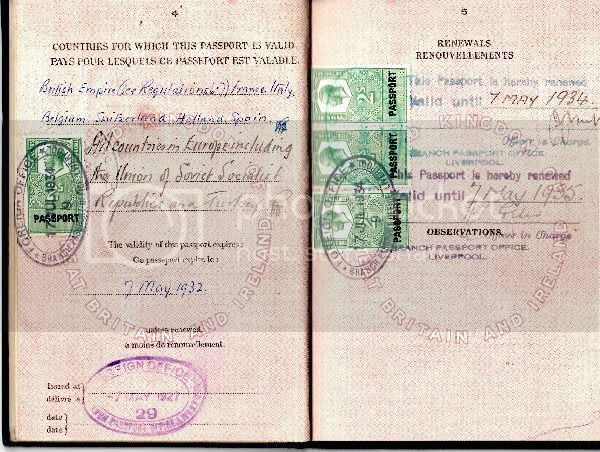 Actually they had the same function of consular stamps but in a period when Germany was under Allied Military Governement so had no authority to issue consular stamps or passports. 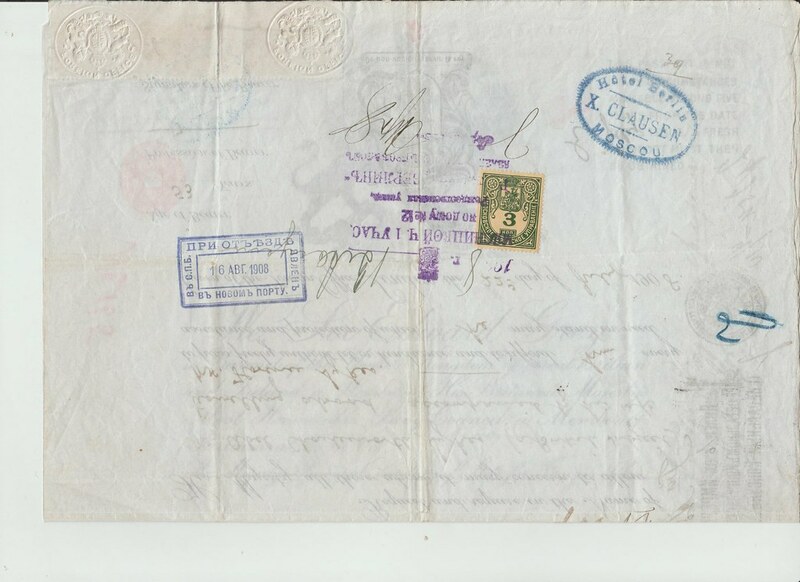 But the fact that these stamps had the a more broad usage than allowing travel to Germany is clearly shown by this rather battered passport issued to a German citizen in Paraguay: as said, Germany under the Allied control was not allowed to issue passports therefore Germans received a "Temporary Travel Document in lieu of passport": in this case the American consul in Asuncion, in Paraguay, acted on behalf of the Allied High Commisison for Germany for issuing a permit valid for Paraguay and Argentina to a "farmer" living at the "Hotel Germania" in Asuncion and willing to move to Argentina. 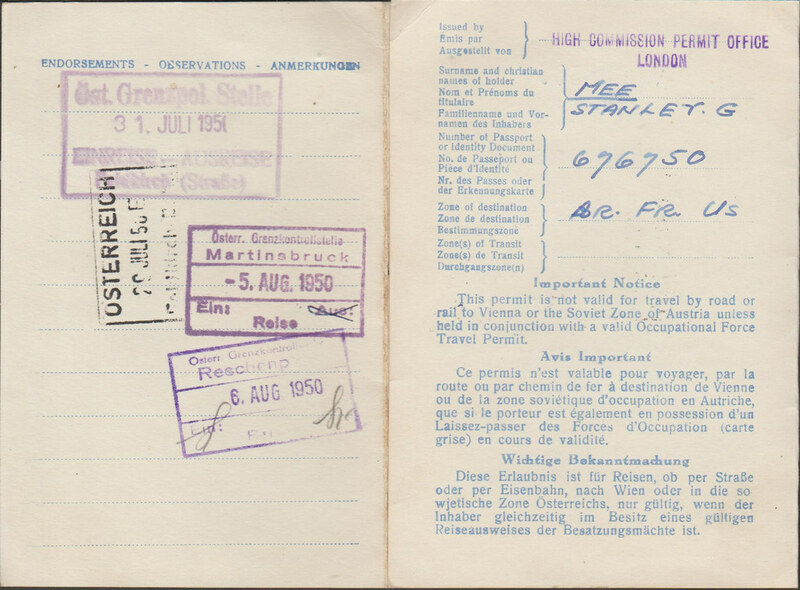 I have other examples of AMG stamps on passports, but I cannot retrieve them very quickly. The Bush-Cass catalogue mentioned in the reference you have found is a catalogue of AMG revenue stamps, so the inclusion of these stamps is perfectly right, although no notice is given of the fact that the AMG used them only in connection to Germany and not, just to mention another AMG controlled area, for travel to Trieste. Less clear is the reason why the Yvert catalogue of French revenues lists them: may be just because France was part of the Allied countries controlling Germany. As soon as I will retrieve other passports out of my GM (general mess), I'll post more pictures. Steve, I would not dismiss so drastically the postage stamps which, when on letters, also may tell stories but certainly I agree with you that very often revenues are very intruguing. I started collecting passports because of the rvenues they carry, but ended up with more than 600 of them just because you can read from them pieces of life, and not always a happy one. Hello Michele (marcadabollo) and Welcome to the forum. Thanks for your reply, that's one of the great things about a growing forum, there's a good chance that eventually someone will be able to answer an outstanding question. Those passports look great with examples of the military travel permit stamps inside. I agree with Steve that revenues can tell a story when still attached to their original documents and it is a shame that, in general terms, most have been cut out. I've had a look at complete passports but most seem quite expensive but I might try some of the cheaper ones. I noticed on eBay a catalogue of AMG Revenues but coming from the USA, with postage, it was about £28. The listed catalogue prices are really wild guesses (bogus), especially the Y&T. A few values were found in stacks of sheets in the vault of the printer in the 1990's. 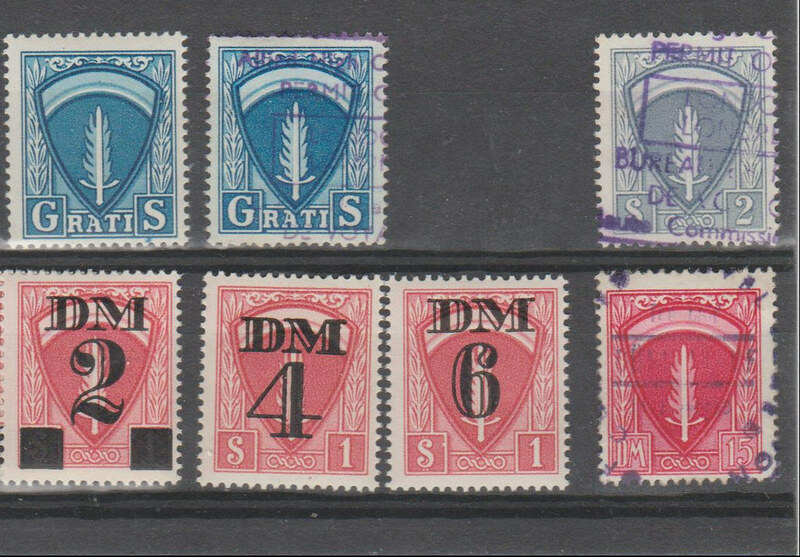 These are the MNH ones offered by companies like Rigastamps: GratiS, Eine Mark overprint, DM2, DM4 and DM6 overprint. Also the unused DM8 overprint and MNH 15 DM are often seen. 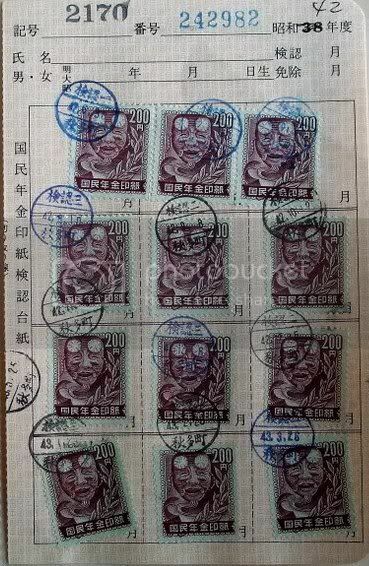 From a collectors point of view, the actual used travel permits stamps are far more interesting. 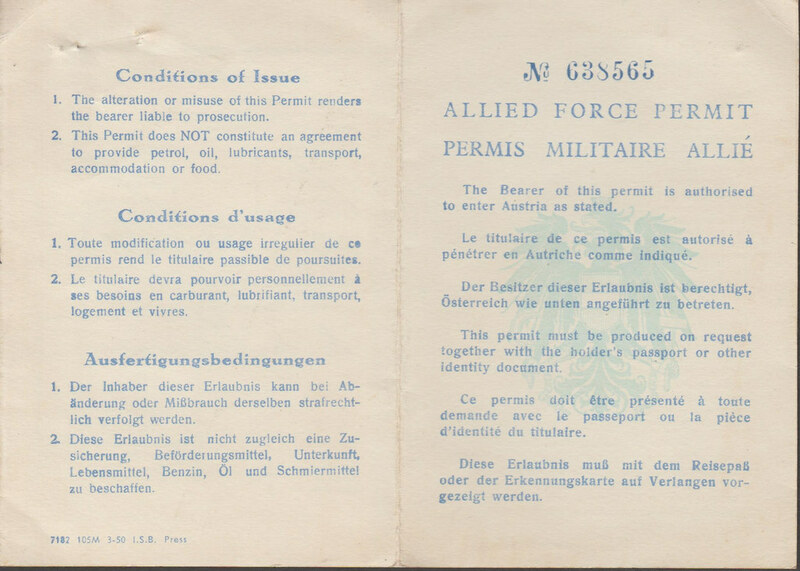 The ones I'm still loooking for are the 50 cents overprint and the higher values used for group travel permits. Anyone? Please contact me, even when only an image of these revenues. If there is interest for examples like the ones Michele showed in his reply, let me know. Hi Theo (TeeJay-III) and welcome to the forum. Thanks for supplying more information on these revenues and for the pictures. That seems to answer my question as to the other values in this series. Whereas I agree that revenues look better in situ, I particularly like your passport with British Consular Service revenues, but with passports starting at about £60 each they're a little out of my league. I'm pleased with the mint versions that I have which I got relatively cheaply but I see your point about the prices of even these mint versions especially since they came from sheets found in 1990s as you say. None of the catalogues that you mention are readily available here with the exception of the Yvert & Tellier fiscal one which is available second-hand at £35 from Amazon which is too much for what would be of minor interest to me. Anyway it is still very interesting to see all of these examples. Good luck with your search for your missing values. Correct Steve, old passports don't have to cost an arm and a leg. Most of the time 5-10 euro. When not buying at auctions sites like eBay that is... or Sothebys. This one went for 70.000 GBP. It's so valuable that even the image of it is protected by password! Thanks, Theo. It has indeed now been revealed in all its glory! It is an example of a Welsh banknote issued, as a bill of exchange (effectively a cheque), by Richard Williams in 1969. The story behind the various notes that he produced is not straightforward. 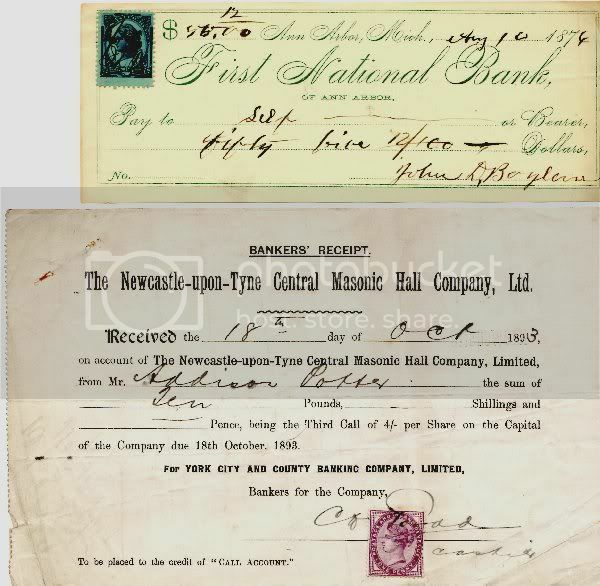 It wasn't a simple matter of wanting to produce the first and only national Welsh banknotes (later when a Welsh bank was formed and recognised they decided not to issue their own notes) but was more to do with Williams believing that he invented the magnetic cheque encoding system, the machine readable numerals printed across the bottom of all cheques, and that he was due royalties for the use of the system. The first issue was produced in small quantities but Williams hadn't anticipated the huge interest from banknote collectors particularly from the US. Indeed, if he had concentrated on this aspect he wouldn't have died a bankrupt but he was totally obsessed with getting royalties from all of the major banks for his encoding system. There is a very good book on this subject; 'Money galore: The Story of the Welsh Pound' by Ivor Wynne Jones, Landmark Publishing (ISBN 9781843060840) but probably out of print. Hmmmm a Welsh First I didn't recognise. What a document! I would feel completely confident going abroad as a British citizen with that tucked into my coat pocket. It just oozes decency and quality. Those were the days! Can you explain this one to a poor ignorant Canadian? What £7 get you? A month of Corrie?